Many times, clients believe that in order to get a truly dramatic and improved kitchen remodel, they must add extra square footage. Sometimes this is true. 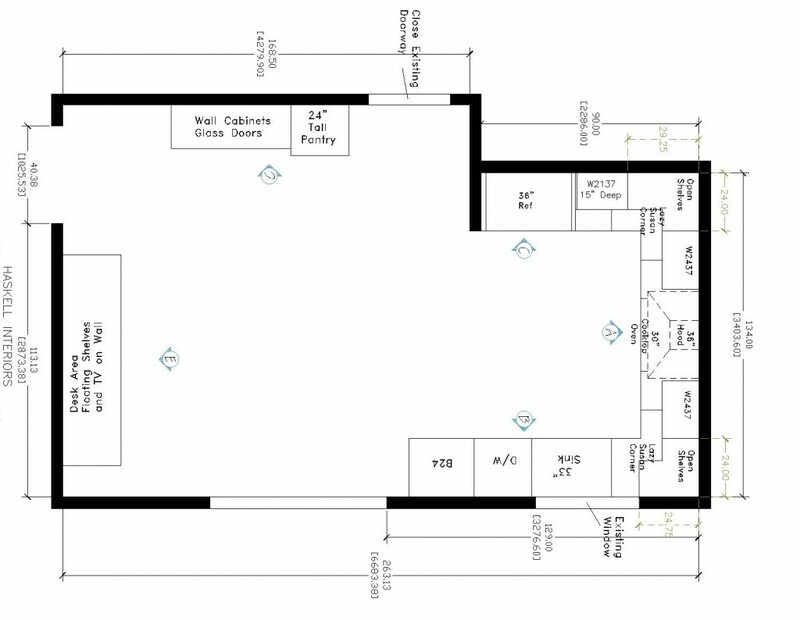 But more times than not, with a new and improved floor plan, as well as upgraded materials and appliances, you can achieve a startling transformation without moving any walls, windows or doors. In fact, when you don’t go to the expense of heavy construction and relocating major electrical and plumbing, it allows more of your kitchen remodeling budget to go for materials and the touches that make your kitchen special and unique. Such was the case for a kitchen remodel we did for an active homeowner. Her kitchen square footage was fairly modest. 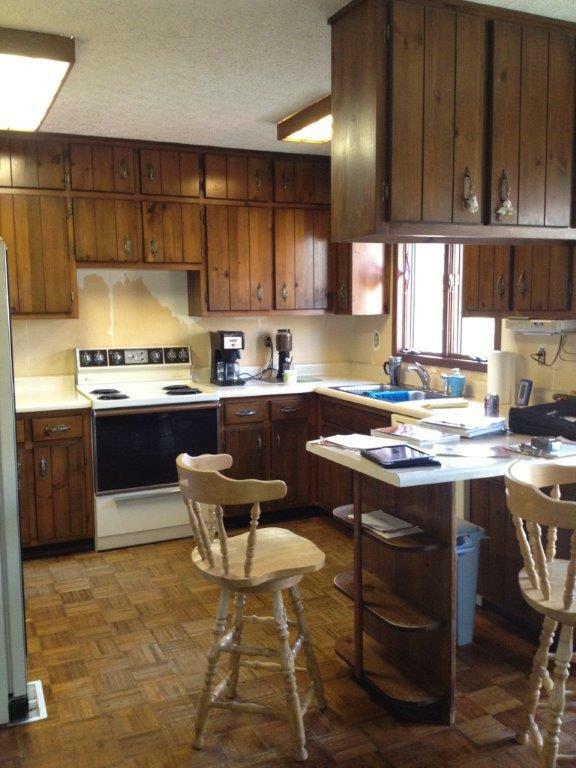 Plus, the kitchen had not been remodeled since the 1970s and suffered from a poor layout as well as outdated materials and appliances. She wanted to create a contemporary kitchen that gave a nod to renewable and “green” materials. She wanted the kitchen itself to reflect the garden and woods located just outside her kitchen door. Finally she wanted to have an area to display her favorite pieces as well as more storage and a small coffee bar area. Her budget was modest, which meant we really needed to strive for keeping the basic plumbing and electrical in place while updating the look and meeting her list of requirements. Luckily she had recently replaced the kitchen window and door, which meant those would stay in place. With a budget and list of requirements in hand, we rolled up our sleeves and got to work creating a kitchen remodel that would delight our client. To adhere to the budget guidelines, we immediately decided to keep the cook top and sink in the same location. The biggest change in the floorplan came from removing the existing peninsula and allowing the cabinets to continue past the kitchen sink window and terminate at the kitchen door going to the patio. This opened up the flow of the kitchen as well as allowing more floor space for a larger breakfast table and chairs adjoining the kitchen. Next, we utilized a section of wall space in the breakfast area to create a coffee bar area and some much needed pantry storage. With our layout in place, it was now time to turn to our selection of materials and finishes. Since the theme of this kitchen remodel was going to be green and renewable products, we started first with the cabinetry. We chose bamboo not only for renewable properties but because it gave a great visual texture and earthiness to the kitchen design. Our floor selection was cork. Again not only a renewable resource, but one that provides a good cushion underfoot as well as quietening the room. All the appliances were chosen for their energy efficiency including the induction cooktop and convection oven. Our countertop choice was a natural quartz selected for its low VOCs, and that less energy is used to process, produce and transport it over typical granite. Finally we chose a backsplash material that is made from 100% recycled glass and used energy efficient LED undercounter lighting to provide illumination. Now we were ready to put our design together. 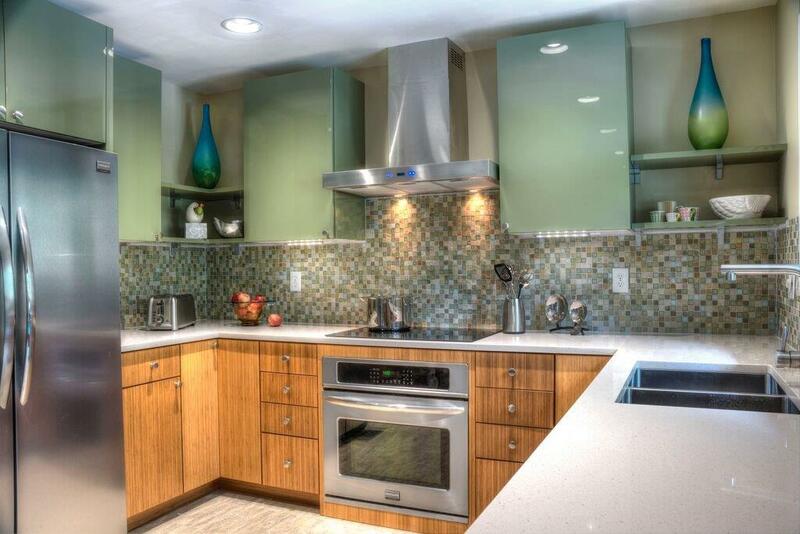 We chose to make this kitchen remodel green both literally as well as figuratively. The addition of green high-gloss cabinets brings a modern touch to the natural materials of the cork, recycled glass and bamboo. To tie in with the stainless appliances we added a modern stainless T-shaped hood as well as floating stainless shelves in the corners of the kitchen for our client to use as display as well as providing practical open shelf storage. 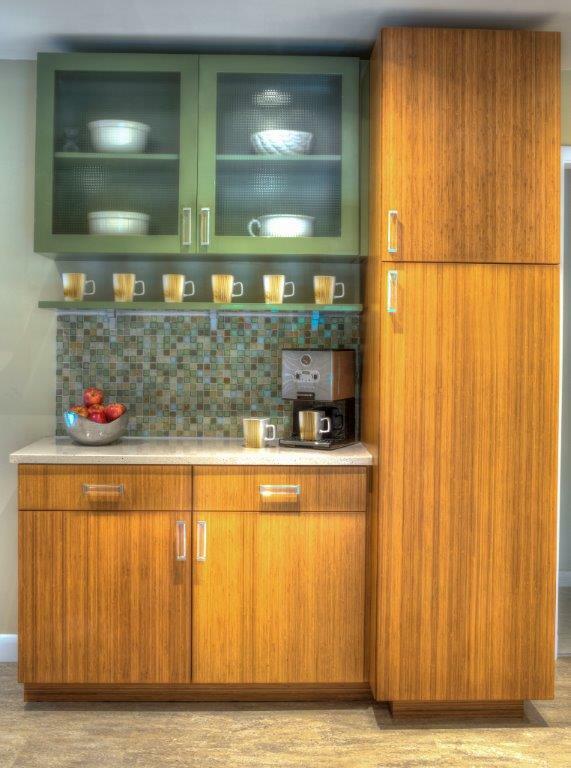 Over at the breakfast area, our coffee bar received textured glass door inserts as well as a floating shelf to display coffee mugs. And while we used a simple round knob throughout the kitchen area, we selected a more modern pull for the coffee bar and pantry cabinetry to give it it’s own unique personality. The same glass backsplash we used in the kitchen we brought over to this area as well. Finally we replaced the two surface mount fluorescent lights in the room with new LED recessed lighting to provide great illumination whether day or night. Our client was thrilled with her new “green” kitchen. We were able to stay on her budget, while providing her with environmentally responsible and green products. And all the while, we created a kitchen that is thoroughly modern in look and exceptionally functional and practical for everyday use.